TV reporter Erica Sparks has become a superstar overnight. But is it due to her hard work and talent? Or is she at the center of a spiraling conspiracy? 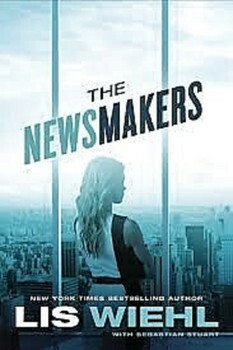 Erica Sparks is a beautiful and ambitious reporter who has just landed her dream job at Global News Network in New York. And while it was hard to leave Jenny, her cherished eight-year-old daughter, in the custody of her ex-husband, Erica is determined to succeed in the cutthroat world of big-time broadcasting. She can only hope her troubled past won’t come back to sabotage her dreams. Although the wounds from her divorce are still fresh, Erica can’t deny the chemistry between her and her new producer, the handsome and empathic Greg Underwood. But a relationship is the last thing she wants right now. On her very first assignment, Erica inadvertently witnesses—and films—a horrific tragedy, scooping all the other networks. Mere weeks later, another tragedy strikes – again, right in front of Erica and her cameras. Her career skyrockets overnight, but Erica is troubled. Deeply. This can’t just be coincidence. But what is it? Erica will stop at nothing to uncover the truth. But she has to make sure disaster—and her troubled past—don’t catch up with her first. OK... bring on the next book! Which you know is going to happen thanks to the ending. I love that ending too. Never mind, I loved the story. That gradual build up is so enthralling as a reader. Usually I hate abrupt endings, but this time it worked. It was more of a BAM moment. This lady is a talented writer. Both of the books I have read I really enjoyed, and they were both very different. I can't wait to read more from her. I really liked the sicko in this story. Well crafted. When you read, you will know exactly what I mean. Mystery fans are going to eat this one right up! **No compensation was received for posting. Compensation will be earned if purchases are made from the link within. A copy was provided to facilitate a review. Opinions are owned by Freda's Voice. Freda's Voice is not responsible for the prize shipment, lost, damaged or stolen prizes. Glad you enjoyed it, Freda. That you're looking forward to the next so much is recommendation indeed! If you mean a fiction series, there's a local author (who used to work at a local tv station) that writes the Riley Spartz mystery books. They have been quite good. I've read an awful lot of "troubled past" stories, but this looks good. I suppose it tells something of her character that she picked career over family. But, would have to assume she was still a likable character or you wouldn't want to read the sequel. Glad you enjoyed it!